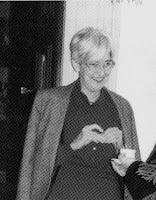 Art historian Melinda Tóth passed away in January 2013, at the age of 74. Melinda Tóth spent a lifetime researching Hungarian Romanesque art and was one of the leading scholars of the field. She worked until her retirement at the Art History Research Institute of the Hungarian Academy of Sciences. 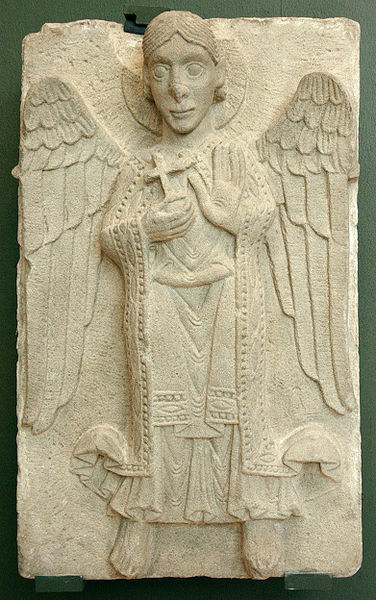 Her research concentrated on two fields: Romanesque sculpture and Romanesque wall-painting, in the territory of the Kingdom of Hungary. She was the author of the most recent monograph on wall-painting in Hungary in the Árpád-period (1974, a revision in the form of an article was published in 1995). In the field of Romaneque sculpture, she concentrated mainly on the study of Pécs cathedral. 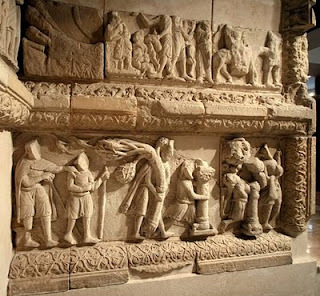 It was largely due to her efforts that the magnificient stone carvings from the medieval cathedral found a permament home in the new cathedral museum, which opened in 2004. 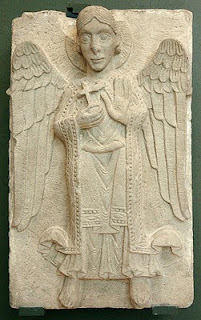 Unfortunately, the catalogue of the carvings and the accompanying study on the cathedral sculptures was not finished until the death of Melinda Tóth. However, she published numerous studies on the subject in various journals and exhibition catalogues. I could not find a bibliography of her works online, but a query in Kubikat gives good results. I had a chance to work together with Melinda Tóth at the mid-1990s, when she worked on the survey and cataloguing of the Pécs sculptures. This material was at the time kept at an abandoned movie building in a village in the hills above Pécs. The situation there was so appaling that even the World Monument Fund was alerted. 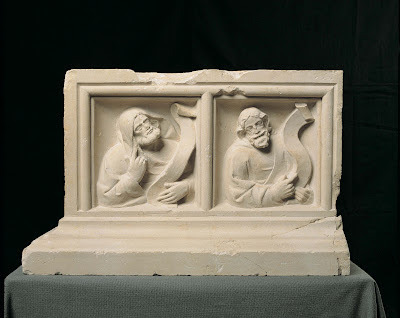 Restoration of the pieces then began with their support. However, it took another ten years for the new museum to be built according to the plans of Zoltán Bachman. My Hungarian-speaking readers can read a new study on Pécs cathedral written by Gergely Buzás, and made available online in memory of Melinda Tóth. I also wrote about Pécs cathedral in a previous post. Hungary's first university was founded in 1367 at Pécs, with faculties of philosophy, law and medicine (no theology). The university was created by the bishop of Pécs, Vilmos (William), with royal support and by a decree of Pope Urban V. The university was short-lived: already in 1395, King Sigismund created a new insitution at Óbuda, and the school at Pécs stopped working some time in the early 15th century (the University of Óbuda was unsuccessful, too). It is believed that the buildings of the University were located on the north side of cathedral, where in the 12-13th centuries the bishop's palace was erected. Indeed, excavations carried out there in 1980s unearthed a large Gothic building, built on the remains of an earlier, Romanesque structure. The topography of this area, however is rather complicated: among other structures the remains of a 14th-century chapel: the so-called Gilded Chapel of Our Lady (mentioned as such in a charter of Pope Boniface IX in 1401: capella deaurata beate Marie Virginis), founded by Bishop Nicholas (1346-1360). Remains of the chapel and the university dissapeared during the Ottoman Turkish conquest and the wars ensuing (Pécs was occupied in 1543). The chapel and other remains on the north side of the cathedral were unearthed by Mária Sándor between 1978-1987). 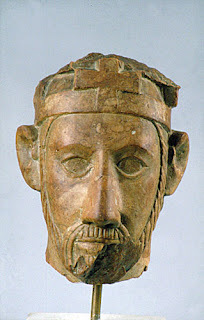 Among the most important finds on the site were the extraordinarily fine statues stemming from the former chapel. After this for many decades, the remains of the buildings stood under temporary roofs, while the sculptural fragments from the chapel languished in storage at the local county museum. 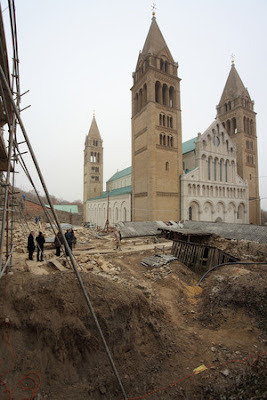 There were many attempts to make the site accessible, but there was never any money for it - not even during preparations for 2010, when Pécs was European Capital of Culture (when a new visitor center was built for the Early Christian ruins, also located near the cathedral). Last year, however, something finally happened - there was a brief new archaeological campaing to clarify some questions, and it was announced that the site will be opened to the public by this year. 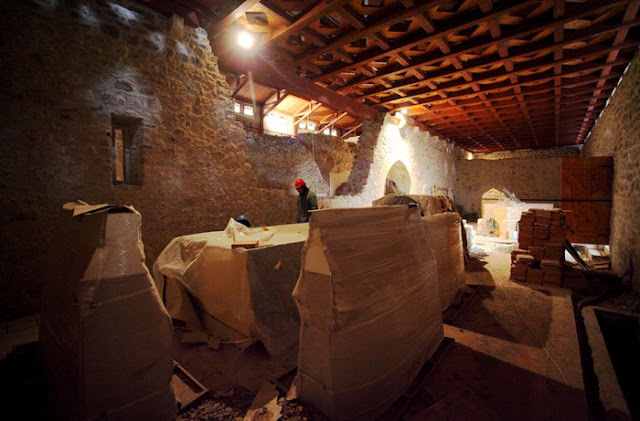 Along this process a lot of additional medieval architectural fragments have been recovered in the area, especially inside the later walls encircling the complex. 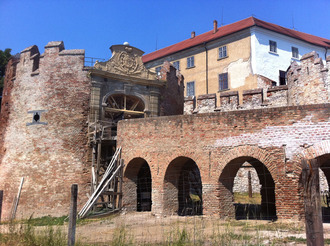 The area is now managed by the Hungarian State Holding Company, and a significant amount was set aside for the erection of a new protective building for the remains of the university and the chapel. In June it was announced that that the university building is ready for visitors, apart from some minor internal restoration tasks. The walls of the medieval fortress structure surrounding the cathedral complex have also been strengthened and a new walkway is being created around them. The opening of this area is scheduled for September, 2012. With this step finally the whole cathedral complex will be accessible to visitors, together with the very rich holdings of medieval sculpture and other remains. I wrote briefly before about the cathedral and the adjacent Cathedral Museum, which holds the Romanesque sculptures from the cathedral. The new area will make accessible the equally significant Gothic remains of Pécs. 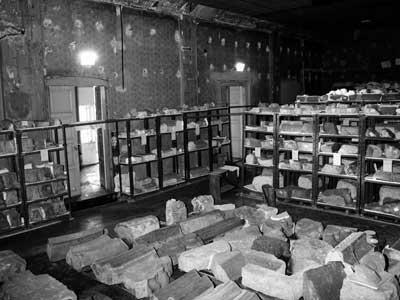 Reports on a research project coordinated by Mária Sándor in 2001-2006, dedicated to the remains of the university and the chapel (with bilbiography). The MA Thesis of Veronika Csikós, submitted at CEU Budapest in 2008, can be downloaded from the website of the University. The thesis deals with the statues of the Gilded Chapel of Our Lady. 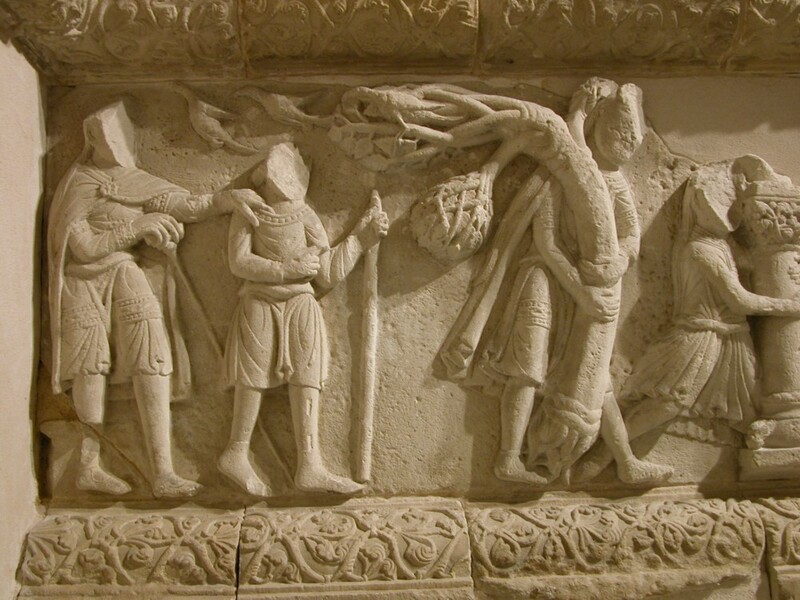 A brief introduction to the site on the Pécs portal. Report on the discovery of carved stones last year, in the online heritage magazine, Műemlékem.hu. 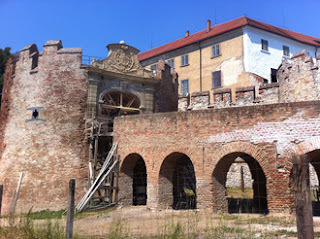 Report on the new excavations at the chapel, on the online journal for medieval archaeology (Archeologia - Altum Castrum Online Magazin), maintained by the Visegrád Palace Museum (with a more detailed report by Gergely Buzás, a PDF-file with lots of images). An image gallery on the website of the local online newspaper, showing the site in May 2012. 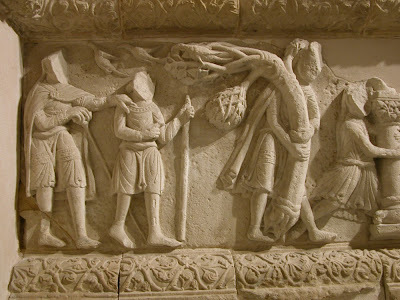 I'm back from my vacation, and I am returning to blogging with a brief overview of news about medieval art and archaeology in the Hungarian press. Summer is naturally the chief season for archaeologists, so there are reports about various interesting finds. The links are all to Hungarian-language news sources - generally with images, so perhaps worth clicking, even if you don't know the language. The historical portal Múlt-kor reports on an early Christian chapel found at Pécs. More and more of the early Christian necropolis there is coming to light. This particular chapel was found in March - current reports are about the decision to re-bury the find, as there is no money to properly conserve and restore the architectural remains. Local newspapers reported first on the discovery - Múlt-kor now reports about the decision to protect the walls by covering them again. In a post one year ago, I wrote briefly about the world heritage site of Pécs, linking to some 3D reconstructions of the early Christian building. South of Pécs, the castle of Siklós is in the news again - Hungary's largest daily, Népszabadság reports about the small late-medieval prayer niche found inside the castle wall there. I wrote about the research and reconstruction of Siklós castle in a previous post - and plan to report in more detail about this interesting painted niche as well. As a further addition for now, I am providing this link to three 360 degree panorama photos of Siklós castle - one of them showing the interior of the famous chapel. 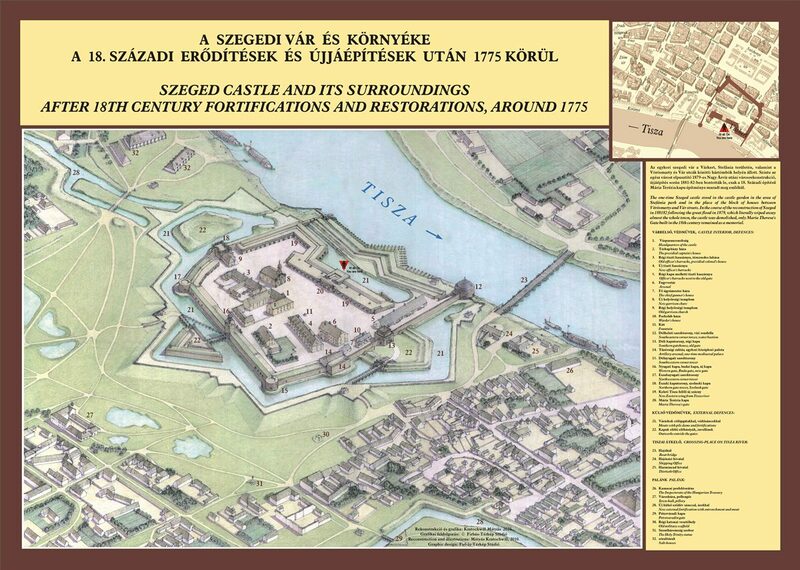 Reconstruction of Szeged in the second half of the 18th c.
Múlt-kor and other sources are also reporting on the excavations at the site of the former castle of Szeged. This year, remains of the southern gate tower were found, in the same area where remains of the southern wall of the castle were identified last year. Excavations in the area have been going on for several years. The castle of Szeged was originally built in the 13th century, and was significantly modified after the town was captured by the Ottoman Turks in 1543. 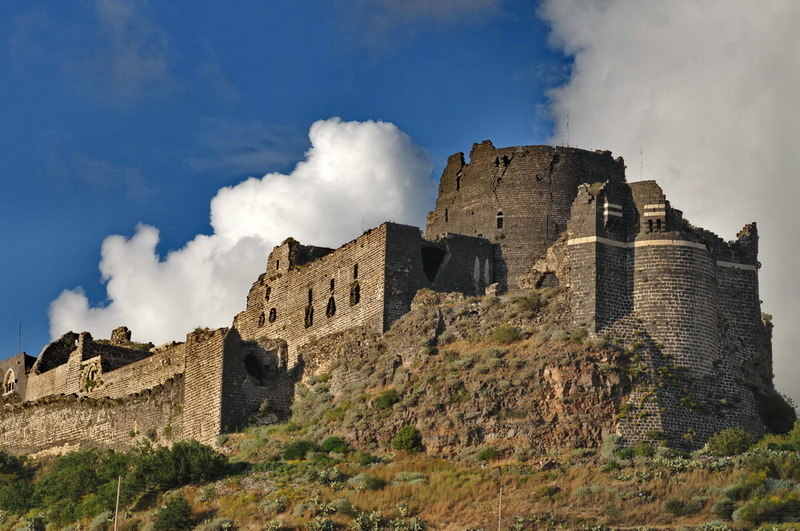 During the 18th century, the fortress fell into disrepair, and was completely dismantled by local citizens after the flood of 1879. Therefore, excavations are bringing to life only the remains of foundations, thereby helping to reconstruct exactly the former extent of the castle. The online magazine műemlékem.hu reported on finds from previous years, with a photo gallery. 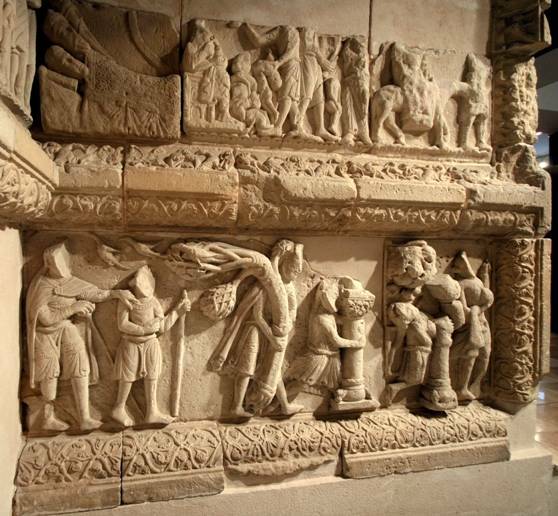 The Hungarian National Gallery in Budapest has one of the most significant collections of medieval stone carvings in Hungary. 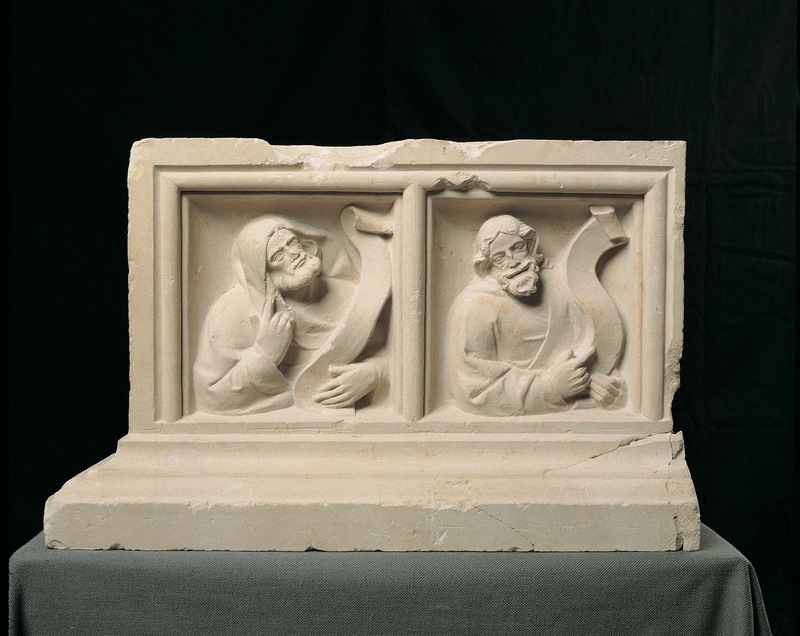 The collection includes the highest quality stone carvings from cathedrals such as Veszprém, Kalocsa and Pécs, as well as fragments from the abbey churches of Dömös or Pilis and many other places. The material is on display on the ground floor of the National Gallery, in the former royal palace of Buda. 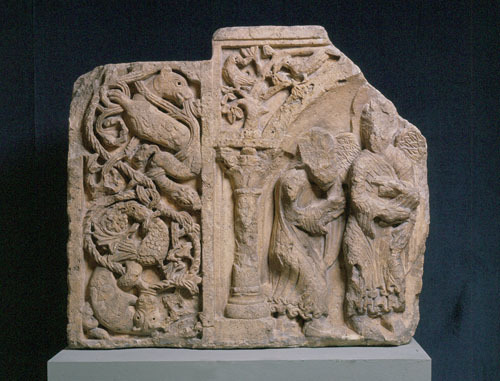 As the first volume of the gallery's collection catalogues, the catalogue of Romanesque stone carvings has been published late last year. 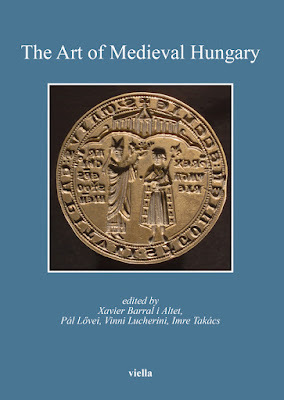 The catalogue was written by Sándor Tóth, university professor at ELTE Budapest, and mentor of generations of medievalists (including the author of this blog). During the last years of his life, Sándor Tóth had a part-time job at the Old Hungarian Collection of the National Gallery, the main purpose of which was the completion of this catalogue. 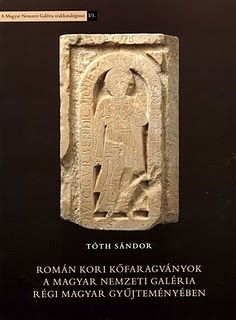 Tóth Sándor sadly passed away in 2007, but by that time the manuscript of this book was largely completed. The manuscript was prepared for edition by Árpád Mikó, head of the collection. The book contains a long introductory study, which essentially gives an overview of Hungarian Romanesque sculpture of the 11-12th centuries. This is followed by 46 catalogue entries, and the publication of some relevant documents about the collection. In addition to hundreds of black and white photos, the best pieces are also illustrated in color. Even though the book is only available in Hungarian, it is an invaluable resource for anyone working on Central-European Romanesque art, and is thus highly recommended. One can only hope that more medieval volumes cataloguing the Gallery's collections will appear in the near future. Tóth Sándor: Román kori kőfaragványok a Magyar Nemzeti Galéria gyűjteményében. A Magyar Nemzeti Galéria szakkatalógusai I.1. Edited by Árpád Mikó. Budapest, 2010. Pb., 200 pages. To learn more about Sándor Tóth, read In Memoriam Tóth Sándor (1940-2007), by Ernő Marosi here (Hungarian-language pdf from Ars Hungarica 2007/1). To browse highlights from the collection of the Hungarian National Gallery, click here. The town of Pécs is one of Europe's Cultural Capitals in 2010. Not much in terms of new buildings was completed by this year - but Pécs has a 2000 year old history, with remains of a number of very important Early Christian and medieval buildings. The early Christian necropolis of Sopiane (Roman name of Pécs) is in fact a Unesco World Heritage Site. The early Christian buildings survived in the level below the medieval ground-level, thus a number of burial chambers have been preserved, with their decoration more or less intact. Buildings above ground did not survive, but can be reconstructed based on archaeological excavations. In preparation for an exhibition, the company SketchUcation Hungary prepared a number of 3D reconstructions.